A new Auto-add Bank Rules feature has just made our lives easier! 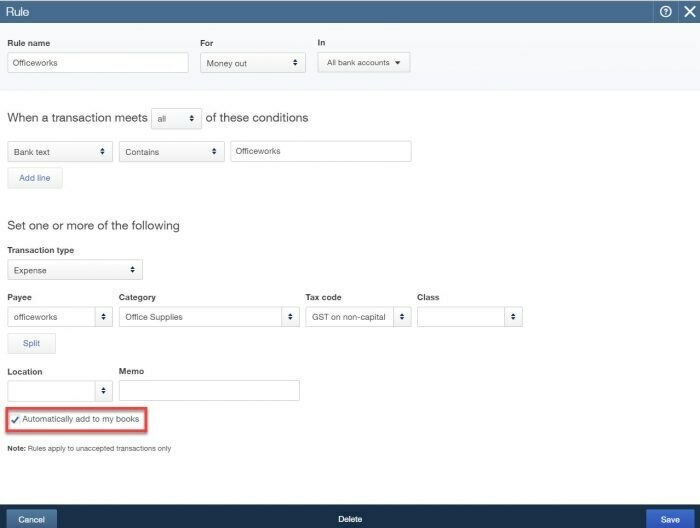 We can now create rules that automatically accept bank feed transactions into QuickBooks Online. This is a huge time-saver. It’s best suited to (but not restricted to) simple transactions such as bank charges and monthly fees, monthly loan or mortgage payments, fuel expenses, and so on. You can find the new Auto-add Rule set-up from ‘Transactions’ on your left-hand side navigation bar. Go to ‘Banking’, then in the top right-hand corner from the drop-down box in the ‘Update’ field, click on ‘Manage Rules’. Click on ‘New Rule’, then set up a new rule, and choose ‘Automatically add to my books’. 1) Set up for a monthly ‘Overdrawn’ account fee at only $9.00. When a transaction feeds through meeting these two conditions, it will automatically be added into your QuickBooks Online file by checking the ‘Automatically add to my books’ box. 2) Set up a simple ‘Officeworks’ transaction. Any transaction with Officeworks as a description will automatically be added as per the set-up of this bank rule and by checking the ‘Automatically add to my books’ box. Once the rule is set up, any affected transactions as in the above examples in the ‘For Review’ are automatically added to QuickBooks Online. You sign in to your file. You run a manual update. A .csv file is uploaded. You create/change an Auto-add Rule. The ‘Auto-add’ rule appears on the ‘Rules’ page under a new column called Auto-add. The icon will appear next to the rules that have the Auto-add feature turned on. 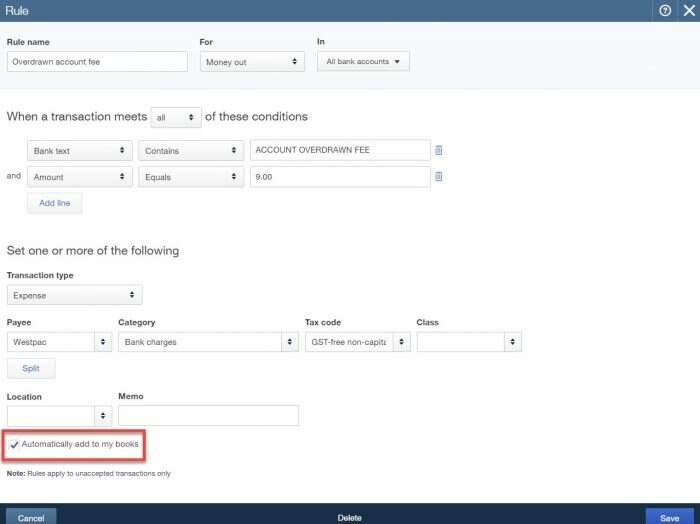 You will find the auto-added transactions under ‘Transactions’, then ‘Banking’ in QuickBooks Online. Then locate the auto-added transactions. If necessary, you can undo. If required, you can filter only the auto-added transactions. Go to ‘Transaction’, then ‘Banking’. Next to the funnel icon, there’s a drop-down menu. Click on the ‘Rule’ drop-down menu, choose ‘Auto-add Rule’, then choose your dates ‘From’ and ‘To’. Set up your rules and choose your conditions to suit your transactions. This latest Auto-add Bank Rules feature can save you a huge amount of time, making it absolutely awesome!